During the early aughts when I was a film student at Hunter College there was a small window of time when yoga pants hadn’t taken over the streets and Polaroid still walked all over digital photography. 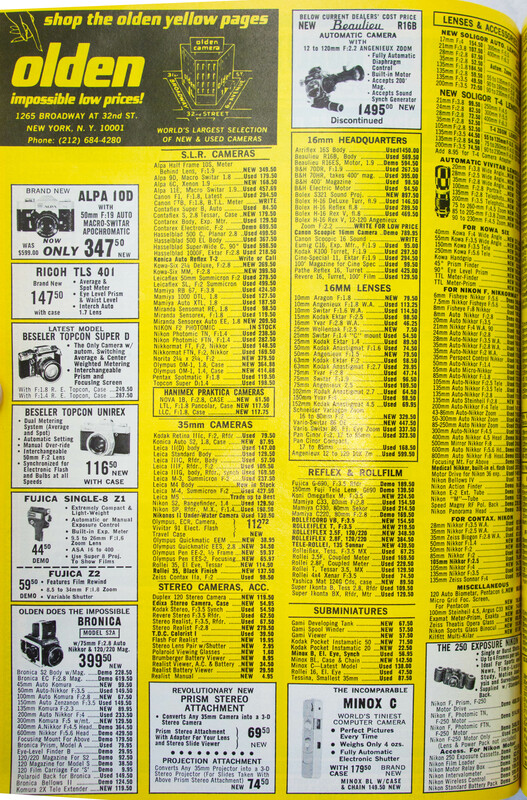 You could get Super-8 film developed same-day and a monthly Metrocard was only $63. After you swiped it and got on those emptier train cars of yore the only thing for a cool city kid to do besides keeping the CD player from skipping was read the latest issue of Vice. When it was only a magazine, Vice was the only one that mattered, right down to the back cover ads inspired by ’80s adult movies, courtesy of American Apparel. As the brand’s retail locations opened up all over the city, what was once just something on the back of the now defunct L magazine became part of my city’s physical landscape and helped define the “new” New York over the next decade. Even in my youth I was a classic camera fan. In 2003, when I was 20 years old, I took a job at Olden Camera. It was a favorite of my photographic hero Arthur “Weegee” Fellig and was one the city’s biggest camera stores before it scaled back in the ’90s with the focus of selling off their massive used inventory to collectors. Coupled with the influence of American Apparel’s imagery, learning how all the old cameras worked was key to me gaining the notoriety I enjoy today. One day, American Apparel’s founder, Dov Charney, walked briskly into the store, dressed head to toe in ’80s fashions. Running from one display case to another in awe of Olden’s glorified museum, Dov pointed rapidly at “this one” and “that one” while I tried to keep up with the details. He finally set his sights on what was actually one of the coolest ’80s cameras we had, the Minolta 110 Zoom SLR. It was essentially a miniature 35mm SLR with its own interchangeable lenses and was made for a niche market; 110 film was a small amateur film format and collectors have long prized the fact that such a complicated camera was created for it. While I wrote out one of the long carbon receipts that Olden still used, I told Dov how awesome his ads were along with his mission to provide Americans with manufacturing jobs, especially for the immigrant class in a place they enjoyed working. He appreciated the feedback and his assistant was kind enough to leave her card when I said I graduating school soon. In the years that followed, sexual harassment lawsuits and financial decline would lead to Charney’s ouster and the elimination of most of the jobs he tried so hard to create. As an ode to the past I wanted to document what was left of American Apparel’s footprint on New York with the Polaroid cameras and film that emulated the ’80s. The stores could always take you away to that bygone era via their bodysuits in the window, but now their take on that style is a bygone era as well– one that all normcore kids can snicker at when we wear what we wore to those McCarren Park pool concerts all those years ago. Correction: An earlier version of this post misstated the former price of a Metrocard. Does anyone edit or even read these articles before posting them? $63 for a weekly metro card? They are only $32 now.